This post was originally published on March 14, 2018. One of my favorite Easter treats are hot cross buns. I love these soft, fragrant buns filled with raisins and citrus peel! The glossy finish of sieved marmalade and the simple icing cross really adds another level to the flavor of these classic springtime treats. Hot cross buns are soft, sweet rolls enriched with dried fruit and marked with a cross on top. They are similar to the British teacake. When are hot cross buns eaten? Most people eat hot cross buns on Good Friday or Easter to mark the end of Lent. What is the significance of hot cross buns? The cross on top of the buns represents Jesus’ death on the cross, while the spices inside the bun are a symbol of the embalming spices used at His burial. The sweetness of the bun proclaims the end of the Lent fast of sweet foods. Which country has the tradition of eating hot cross buns at Easter? Traditionally, hot cross buns are predominately eaten in Great Britain, Canada, Ireland, Australia, New Zealand, South Africa, and some parts of the United States. Do hot cross buns contain alcohol? Nope! The buns do not contain any alcohol. Like any yeasted bread, the yeast naturally produces alcohol, but that is baked out of the bread. How do you make the cross on top? There are a multitude of different ways to make the festive cross on top of these hot cross buns. Here’s some popular ideas. Old Fashioned: use a knife to cut a cross on top of the buns. Traditional: use strips of shortcrust pastry or a flour and water paste. American: use a water icing (sifted icing sugar and water mixed together). Modern: anything you want–from stripes of mixed peel to lines of chia seeds. What goes with hot cross buns? The best thing to serve with hot cross buns is just salted butter. Split the bun in half, toast it if you like, then spread it generously with butter. Should hot cross buns be toasted? Yes, they can be split in half and toasted; it’s up to you. Personally, I like to eat fresh hot cross buns as they are, then toast leftover ones. Can hot cross buns be frozen? Yes, you can freeze hot cross buns. Let the baked buns cool completely, then seal them tightly in a zip-top freezer bag and freeze for up to 1 month. Gather the ingredients for the hot cross buns. Pour the milk into a small saucepan and bring to a gentle simmer on medium heat. Remove from the heat and let it cool to 115 F.
Add the flour to the bowl of a stand mixer, pouring the salt and yeast on opposite sides of the bowl. Stir each one in with your finger. Mix in the sugar, mixed spice, orange zest, and butter until blended. Add the egg and milk until a sticky dough forms. Shape the dough into a ball, place in a buttered bowl, and let it rise in a warm place until doubled in size, about 1 hour. Dump the dough back into the bowl of the stand mixer and knead in the cubed apple, raisins, and mixed peel. Divide into 12 balls, using a kitchen scale for accuracy, then place in a buttered 9×13-inch pan. Cover with a clean garbage bag or buttered plastic wrap and let rise in a warm place until the buns have nearly doubled in size and their sides are touching. While the buns are proving, gather the ingredients for the glaze and icing. You’ll need orange marmalade, icing sugar, and water. Sift the icing sugar into a bowl, then stir in enough water to make a thick icing. Briefly heat the marmalade with a small splash of water in a small saucepan, then use a spoon to press it through a sieve. This removes the orange peel, leaving a smooth orange glaze for us to use on the buns. Bake the risen buns at 400 F for 10 minutes, then lower the temperature to 350 F and bake for another 10-15 minutes. The rolls should have an internal temperature of 190 F. Brush the sieved marmalade on the hot buns. Let the buns cool completely, then pipe an icing cross on each one. Enjoy with family and friends! Knead the dough by hand. It’s much easier to gauge the feel of the dough when you’re working it by hand–plus, it’s fun! Don’t have mixed spice? Make your own instead of leaving it out. Mixed spice has a unique flavor that can’t be accurately substituted. Use homemade mixed peel for the best flavor. Store bought peel is overly sweet and doesn’t have a rich citrus flavor. Knead in the fruit after the dough has risen the first time. Putting the fruit in when you mix up the dough will slow down the first rise. Be careful not to overbake. Too long in the oven will make the buns dry and unappetizing. Eat these buns within 12 hours or freeze for later. Homemade hot cross buns don’t contain preservatives and lose their freshness quickly. Hungry for more spring desserts? Try these other delicious recipes! Lemon Meringue Pie: fluffy meringue and lemony filling make this dessert a real favorite. World’s Greatest Carrot Cake: a supremely moist spice cake enriched with fruit and nuts. 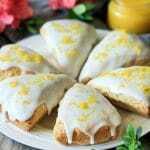 Easy Glazed Lemon Scones: easy to make scones topped with a tangy lemon glaze. The pleasure of a 5-star review of this hot cross bun recipe would be greatly appreciated.